Media bias does not always take the form of outright fabrications or partisan sloganeering. Sometimes, all it takes is a convenient lack of journalistic inquisitiveness, as seen in a recent CBS MoneyWatch report by Kate Gibson (“Colin Kaepernick is Nike’s $6 billion man”), trumpeting the apparent success of Nike’s ad campaign featuring the former pro quarterback. The fact that this paragraph refutes the point of the story evidently escaped the author’s notice. Nike is the Dow’s top performer for the year, but the value it has gained over the past two weeks must be Kaepernick’s doing? In truth, Nike’s value has been skyrocketing (so to speak) for as long as it’s been traded on the Dow, although it has had one of its occasional, very slight declines during the week since the media gloatfest began. Over the past ten years, the company’s stock value has more than quadrupled. A business reporter for one of the Big Three networks ought to realize how misleading it is to say a stock “continues to hover at an all-time high,” when its past all-time highs have occurred about as routinely as partly cloudy days. If Gibson wants to point to a moment at which the increase in Nike’s stock value began to exceed the norm, she’d have to go back to June 28th, when a much stronger than expected earnings report caused it to surge by more than 11 percent in a single day. It has since not only solidified those gains, but continued to build on them. Investors’ enthusiasm was stoked by a boom in overseas earnings, especially from China. Granted, any message from the Communist propagandist Kaepernick would likely be embraced by the Red Chinese, but does anyone believe he’s responsible for the people of that country purchasing more Nike merchandise? That’s about as totally divorced from reality as the “educational materials” the ex-QB distributes at his Black Panther-inspired children’s indoctrination camps. To an objective reporter, the best that could be said about the Kaepernick campaign from Nike’s point of view would be that its negative impact has been minimal. Since it began, Nike stocks have experienced two downticks, on either side of several routine days of robust growth. There’s no honest way to get from there to “Colin Kaepernick is Nike’s $6 billion man.” There’s not even any logical way to justify whatever amount the shoe company is paying him. If there were no political angle to this story, the business media would probably have reported it responsibly. Before attributing Nike’s most recent gains to Kaepernick, Gibson or her editor would have stopped long enough to ask what Nike stocks usually do, and whether the current results represent a departure from, or a conformity with, the norm. The difference is that this is really not a story about the performance of Nike stocks, but an attempt by the liberal media to validate Colin Kaepernick’s point of view, without having to take on the impossible task of rationally defending it. The message of the story, as evidenced by the many other news stories that giddily referenced it, is that Kaepernick’s beliefs, to the degree that he has coherently enunciated any, are right. America really is the rotten, unjust, oppressive country he says it is, and this has now been ironically demonstrated by his popularity within our own decadent capitalist system. Those red-state yokels who had promised a boycott have been shouted down by the masses. The Consensus has spoken! It’s only natural that there was no fact-checking done on whether Kaepernick had added $6 billion to Nike’s value. The liberal media already feel that the underlying, anti-American narrative is true, so the veracity of the story demonstrating this “truth” is of little importance. 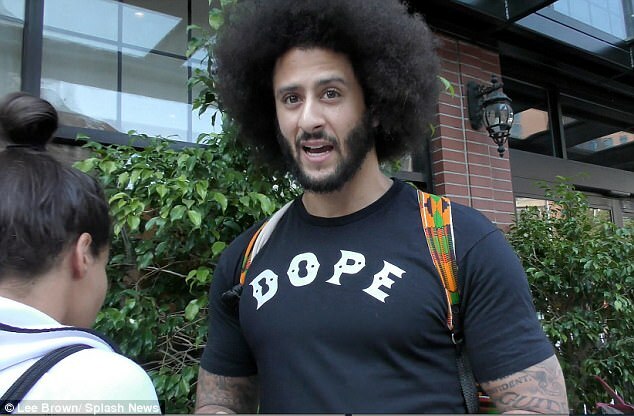 As for Kaepernick, he’s only too happy to accept Nike’s multi-million dollar contract, as well as the daily posterior-puckering he receives from the media. Sure, his ad claims he’s “sacrificing everything,” but why pick that point to start letting the facts get in the way?